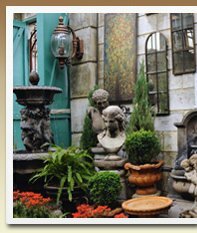 The backbone of Sandstone Garden's growth the last 24 years has been the production of Home and Garden Statuary; always a vanguard of the vision, Sandstone encourages clients to use stone accents for the interior of the home as well as the traditional outdoor and garden settings. Sandstone's statuary is not to be confused with actual sandstone, which is very porous and not enduring to frigid climates. A very dense cement and marble dust mixture gives our statuary its enduring quality. We never use any ingredients or processes which lightens the weight, or accelerates the process, which would ultimately compromise its integrity. There are many products marketed which do this for mail order purposes, while always using the word "stone" in their presentation. 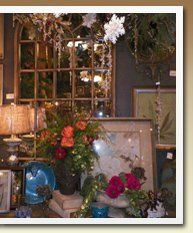 Our wholesale clients range from large garden centers to antique shops, interior and landscape designers, contractors, and gift boutiques. 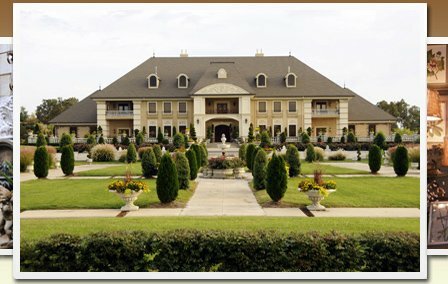 The great aspect of Sandstone's statuary line is that we are not one of the "wholesale giants". There are no representatives that sell the line, and it is not shown at any major markets such as Dallas or Atlanta. Our clients have always been obtained by word of mouth, or contacts made at retail flower, garden, and antique shows while seeing the product in person. Offering over 1,500 items, our statuary catalog is always a work in progress, and never a finished one, discontinuing, and adding new items on a regular basis. The line offers a plethora of original copy written designs, as well as a tasteful selection of reproductions. Along with the traditional fountains, benches, statues, and birdbaths, the variety includes cats, dogs, finials, frogs, gargoyles, and rabbits among others. In urns and planters alone, Sandstone offers over 300 selections. Our staple finish, the original "Mocha Antico" is a patina that gives a look of distinction to each enduring piece, acclimating itself from season to season, year to year, decade to decade. While some companies pay for the privilege to have their product pictured and associated with estates of the past; and present it as if bequeathed to them - Sandstone Gardens in these respects is the genuine article, nurturing the growth of a first generation business, having the faith and vision to bring to the heart of America a showroom, gardens and product, inspired by, while lending a venerable respect to the estates and generations of the past. Not available at this time, but...Coming Soon!! We will be providing a customer hub for our established wholesale clients. This will feature most of the items in our collection that are available to you. If you would like more information about our wholesale program please contact Max Carr.